Los Angeles A couple of years ago I spent a fascinating period over almost a year working with Casa de Maryland. They began as a collection of workers’ centers and have become the largest immigration rights statewide organization in the country with huge victories to their credit in winning drivers’ licenses and a state DREAM program along with a membership of over 25000. 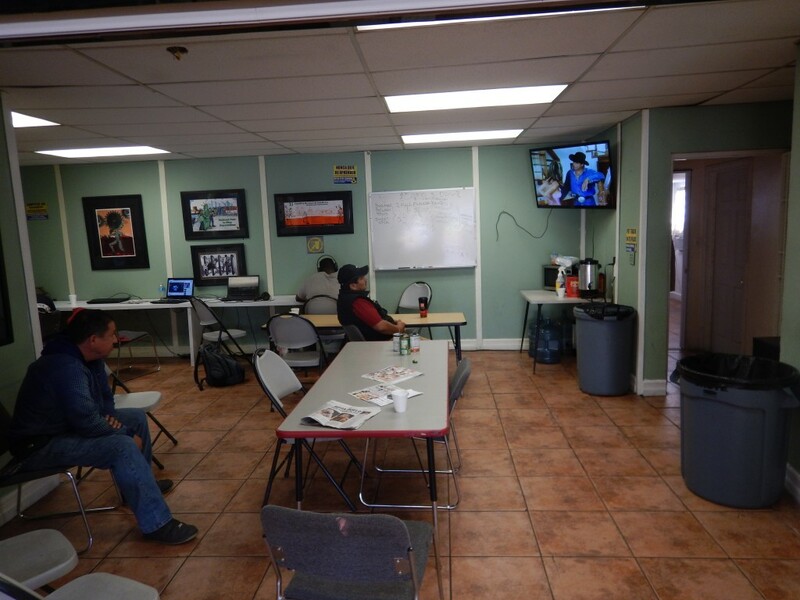 All of which is a long way of saying that I jumped at the chance to take a good look and visit with the folks at the National Day Laborer’s Organizing Network’s (NDLON) operation at the Pasadena Job Center in Los Angeles County. After years of hand pressing identification badges both with ACORN and in various ways still with our street vendors and hawkers’ union in India, the first thing my eye fell on at the Pasadena intake desk was a good sized oval machine that I just knew had to be the best looking automatic computer driven ID contraption this side of the public driver’s license people. 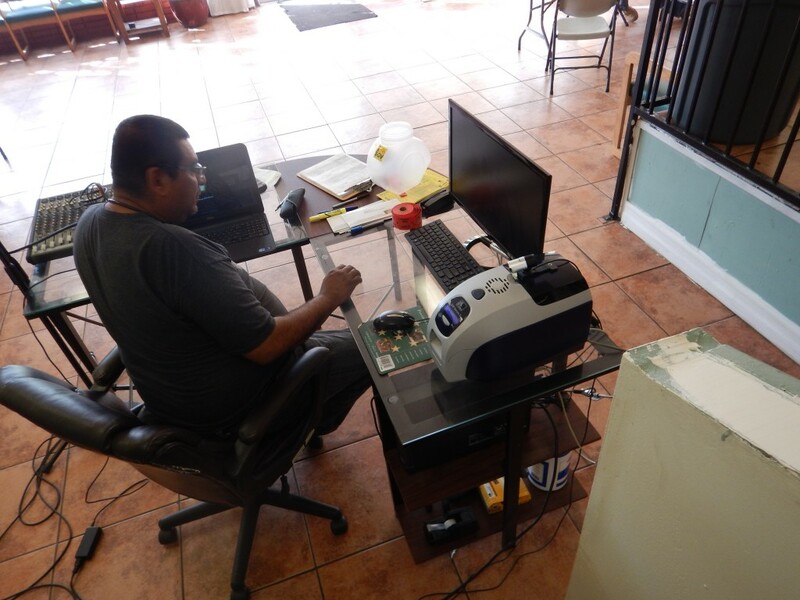 One thing led to another and the next thing you know Angel Olvera, the center’s coordinator, was waking me through “MACHETE,” which is NDLON’s very sophisticated data base system. Not surprisingly the system did more than record name, address, cell, and whatever by also cataloging each individual worker’s skills, so that they could more easily be matched with job calls from employers. 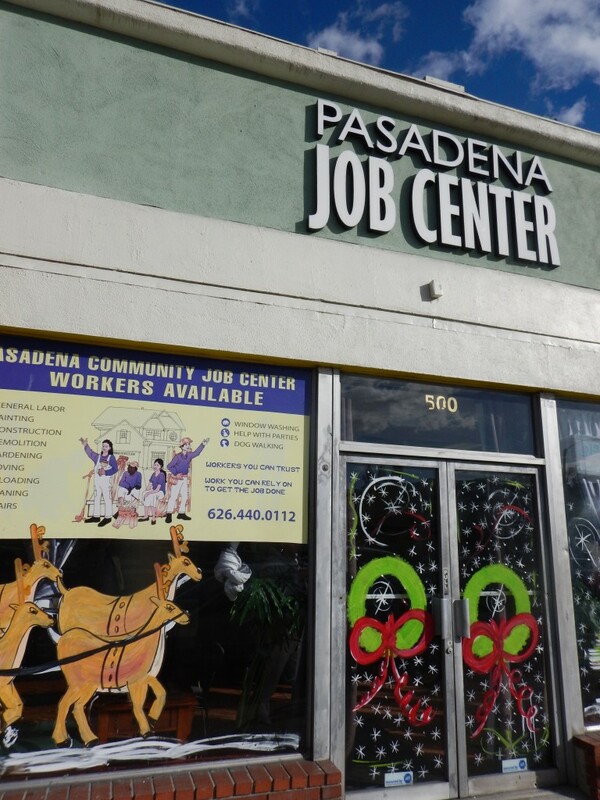 And, that’s not easy either because of the 500 workers regularly working out of the center over the year and a center operation that puts out 13,000 people annually, there are also almost 1300 employers in the database that the Pasadena center has to manage. In the same that a workers’ center is handling workers, virtually one at a time, on an almost daily basis, the same can be said about many of the mom-and-pop employers who may be only calling in a couple of times a year for odd jobs, gardening, and whatever. For example, the center was running a special for employers who needed a hand putting up Christmas lights, especially since December is not the busiest time of year. With a line out front at 6AM every morning in Pasadena, the natural question is how do workers actually get the jobs? Several decades ago I had spent an interesting early morning period watching the hiring hall operation of the janitors’ union in San Francisco in the early days of Radio Shack computers and dot matrix printers where they were pioneers at using computers to match workers and jobs. At the time as they registered the computer would spit a number and location out of the printer on the match as hundreds of jobs were sorted out every morning. In Pasadena, there are usually 50 workers on average for 35 jobs early in the morning, so I was curious how they used the computer system for that. With a laugh, Angel pointed me to a big roll of red raffle tickets and a plastic bin, I laughed too, and agreed you sometimes just can’t beat a transparent system that everyone can eyeball for fairness compared the mysteries of the machine. You ask, how are the workers’ paid? The center and its members years ago set $15 per hour as the base rate and that’s what the employers are informed by the center, but the workers actually negotiate directly as subcontractors with the employers and are paid directly as well. In a small move toward self-sufficiency the center now collects one dollar per job. 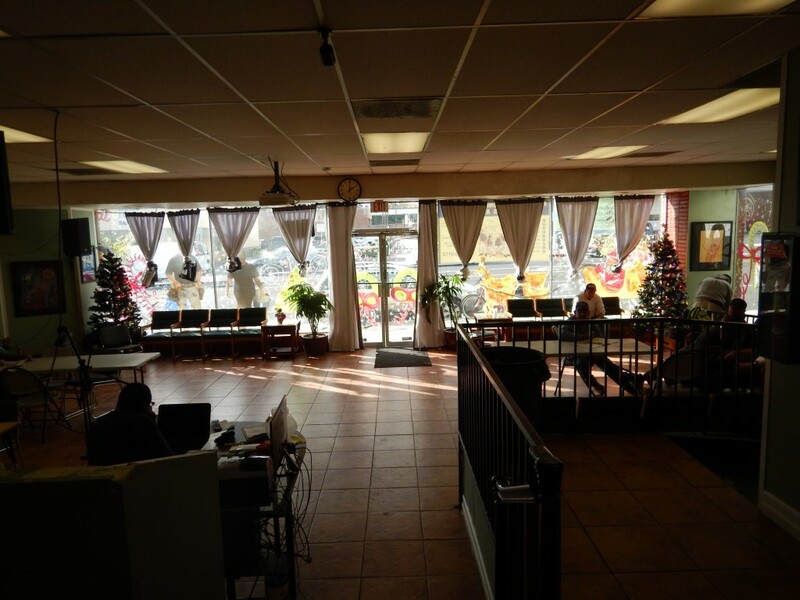 Pasadena, like so many of the workers’ centers around the country, is in some ways like the old classic multi-purpose center that cities once built around the country offering everything but a gym. Gardening skills are displayed in elaborate, native plant beds along the side of the city provided building. A garage is being turned into a tool and work space for some of the more complex jobs the center is handling. They handle immigration issues obviously and advocate aggressively in that regard but also in the areas of wage theft. A small household workers cooperative also works out of the space. Joining with the rest of the community they have become a meeting place and gathering point for the fight for $15 for the entire city. Pasadena is a good example of a deeply rooted base laying a firm, practical foundation that could support a very expansive membership and movement for informal workers and the entire community. There are models that could be built here, and for now it was a great place to take the tour. This entry was posted in Citizen Wealth, Financial Justice, immigration reform, Labor Organizing and tagged Pasadena Workers' Center, workers by Wade. Bookmark the permalink.